Toshiba is following Acer into 8-inch Windows 8 tablet territory with a device dubbed the Encore. Perhaps the most exciting part about the new slate is that it houses Intel's Bay Trail Atom processor, meaning it will run all of your old desktop Windows apps. Intel has previously promised that the CPU will also mean half the power requirements and a 50-60% improvement in performance over its Clover Trail chip, which featured in the only other 8-inch Windows slate on the market, Acer's Iconia W3. Though the Encore matches the W3's 1280 x 800 pixel resolution, Toshiba has pointed out that it uses a new type of TFT IPS display technology called HFFS to provide "wide viewing angles" after the W3's poor display was widely panned for providing more-than-lacklustre viewing angles. Other features include an 8MP camera, stereo speakers, InstantGo to receive updates while in sleep mode and a range of sensors that include a gyroscope, accelerometer and GPS. 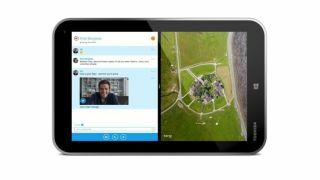 Toshiba is pitching the Encore as a consumer and corporate device thanks to dual microphones and an integrated 2MP front camera geared toward Skype use. The inclusion of Microsoft Office Home & Student 2013 will also lend the tablet some productivity chops, though there's no sign of a keyboard accessory, so it may be a case of relying on third-party Bluetooth accessories. The Encore is set to arrive with 32GB of storage and features connectivity options in the form of a Micro USB 2.0 port, Micro HDMI and microSDTM to extend storage by 32GB. Wireless connectivity is present in the form of dual-band 802.11 a/b/g/n WiFi. The Toshiba Encore release date is set for November, with pricing at $329.99 (around £211, or AU$361), undercutting Acer's Iconia W3 by some way.